At the most basic level table salt is a compound composed of two elements, sodium (Na +) and chloride (Cl-), which through the miracle of ionic bonding form what is called sodium chloride. In general chemistry any chemical reaction in which an ionic bond is formed through a reaction involving an acid and base creates a compound called "salt". 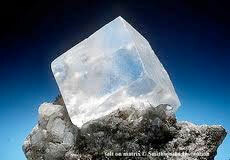 Sodium chloride (NaCl) forms colorless, cubic crystals, similar to blocks stacked on top of each other. The ionic bond formed in salt is what allows for the great salt chemistry we see in our bodies and nature. These bonds and the electrons surrounding the atoms (Sodium and Chloride) create other bonds and reactions with other elements in nature. One area in particular is with water balance within our bodies. Where there is salt, water will soon follow. If we consume too much salt, water will move out of our cells to balance the salt concentration inside and outside of our cells. If this balance tilts too far from middle we can become sick and have problems with blood pressure and electrolyte balance. Sodium chloride is frequently found in nature as the mineral halite (to learn more about the mineral click here), or rock salt. Some common places to find halite are the Great Salt Lake in Utah, the Dead Sea, and of course where our team is running, the largest salt flat in the world, the Salar de Uyuni. There are many locations throughout the world where you can find salt, there may even be a salt flat, salt water basin, or salt mine near you. There are many uses of salt which will be discussed in detail in later posts. Salt is such a key component in peopleʼs lives that annually 200 million tons of salt is produced, with the United States and China being the leading producers. Furthermore, civilizations have formed around salt and salt has had a critical impact on human history. Now that you have a basic chemical understanding of salt we will move onto salt in history and how these two simple elements (sodium and chloride) have come together to shape human history.